A handful of the add-ins on this site have featured access to PDFCreator functions (where available) to create PDF format documents. I had originally configured them for the Version 1.7.3 of PDFCreator even though PDFCreator had moved on to later and more sophisticated versions. However I was persuaded by my friend Greg Maxey to update the add-ins to use the later versions of PDFCreator, which required extensive reworking of the code, as the earlier code was only compatible up to version 1.7.3. Given that Greg also provided the core code, it would have been churlish not to update the add-ins and for the past few weeks I have been doing that. The code also gave me the idea of providing a simple to use add-in that simplified PDF creation from Word using the enhanced functionality of PDFCreator to both create PDFs including PDFs with additional security, including password protection with encryption, and to send the PDFs to e-mail recipients as attachments either by using the default e-mail client (Outlook) or by sending direct to the SMTP server of any e-mail account the user is subscribed to. The add-in may be installed by copying the template to the Word Startup folder (replacing any existing version of the template), or you may use the self extracting installation file also contained in the zip file linked from the download button at the foot of this page. In either case you must restart Word to load the add-in. in the Windows File Explorer Address bar and pressing Enter. The add-in will only process documents that have been saved, as the document name is used to derive the PDF (etc) filename. If you attempt to process the add-in template, or with no document open the process will warn you and close. After the usual disclaimer, the process will open a userform from which to make the basic selections, with context sensitive help available by clicking the '?' buttons. The various PDF options are well documented on line and can be found with a simple internet search, so I don't propose to explain them here. For most users, the vanilla PDF option will be all that is required and this is the default setting. 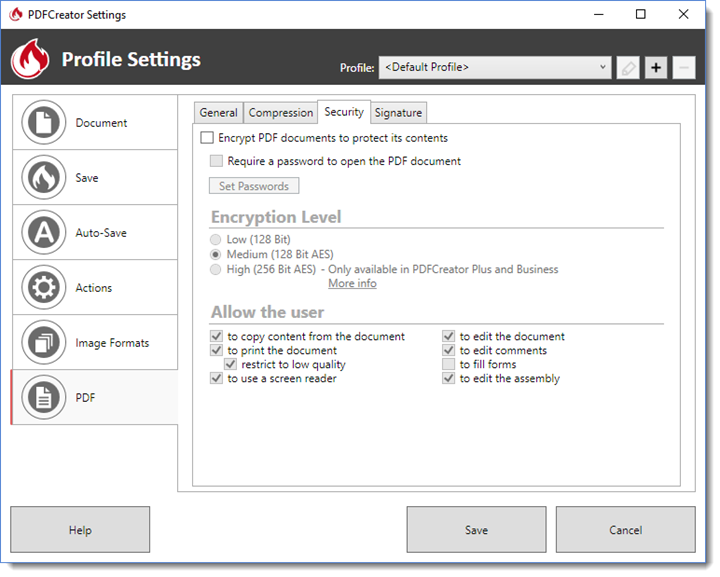 In addition to PDF, the add-in also accesses PDFCreator's ability to create TIFF, JPEG, PNG and even Text files. TIFF format produces multipage TIFF format files from multi-page documents. Multipage TIFF files are not compatible with some graphics viewers and editors. Separate JPEG and PNG files are produced for each page of a multipage document. The Text option is an odd one, included for completeness. It produces a text file that retains the layout of the document. This is something of a mixed blessing and most users will find that saving to plain text from Word will be all that is required. The option is however there for those who require it. The Security Properties when shown are enabled by typing a Master Password. 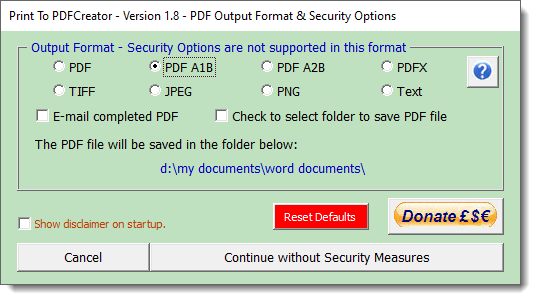 The other options are documented in PDFCreator so I don't propose enlarging upon them here, other than to suggest that for maximum security you should set a User Password, which requires the user to enter a password to open the PDF document, which is thereby encrypted. 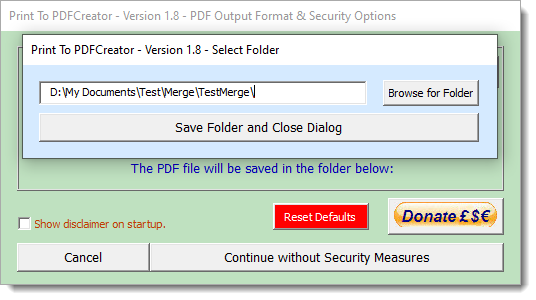 The level of encryption is determined by PDFCreator and cannot be changed from the add-in. The free personal version provides 128 Bit AES. 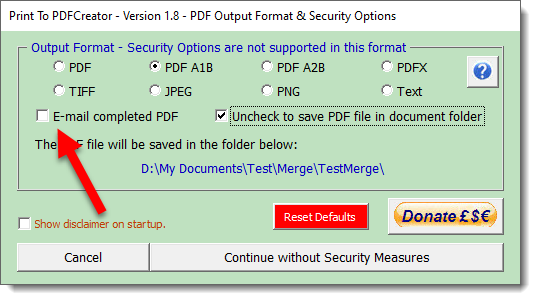 Back to the add-in and by default the output files are stored in the same folder as the documents from which they were created, however by checking the 'Check to select folder to save PDF' check box a further dialog is presented to select and store an alternative folder to save the files. In the case of documents that have never been saved, the output files are created in the User Documents folder defined in Word's Options - By default this would be 'My Documents'. As folders can be deleted between uses, if the stored folder is not available on subsequent use, the stored folder is reset to default status. The text boxes need no additional explanation, but there are two checkboxes at the top of the section. By default the process will use your e-mail client to send the message. In the case of Outlook, this will create a message that will be created using the default e-mail account and the default signature associated with that account. However you may by checking the box send the message directly to the SMTP server of any e-mail account you have available. The messages are not recorded in the Sent Messages folder of your e-mail client. The data entered in this form is stored in the registry so for PCs where the same log-in is shared between users, you may wish to leave the button for 'Retain password' unchecked. Clicking the red Reset Defaults button will clear all the registry settings associated with the add-in, which are primarily related to e-mail options. The add-in is extensively error trapped and there are help and warning messages displayed when you make an obvious error, and to advise you of the status of the file creation. PDFCreator is a free (for personal use) but powerful utility to create PDF format files. including secure PDF format files that Word's rudimentary PDF function is incapable of creating. 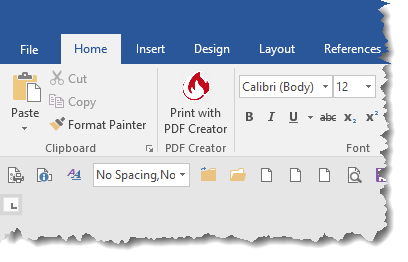 The add-in on this page provides easy access to the main features of the utility to create PDFs from Word documents with just a few clicks. It does not pretend to do anything that cannot be achieved by printing to the PDFCreator driver.